New Orleans was a whirlwind of coffee, community, and collecting new knowledge. After a night of dorm-life (Melanie’s brother let us crash on the floor of his freshman room) we headed over to a coffee shop that takes supporting the local community, especially post-Katrina, deeply to heart. Fair Grinds is located near the Fair Grounds race track. 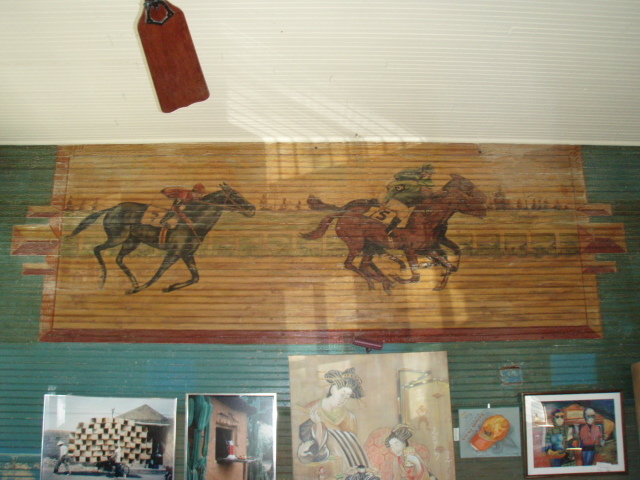 Before opening Robert removed 5 layers of wall covering until they found the original beaded board with paintings from the 1930’s. 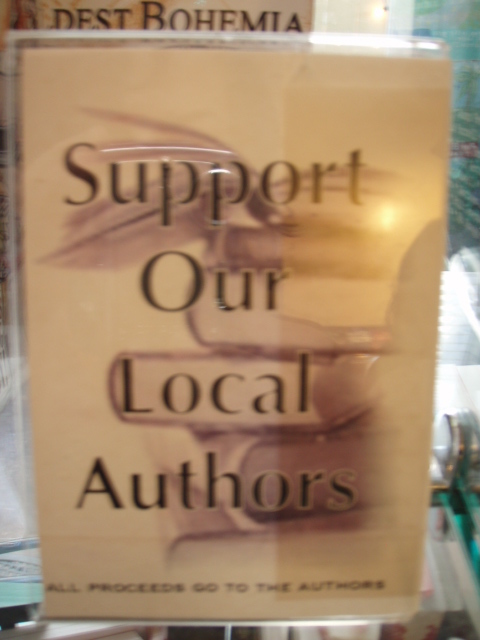 In 2002 Robert, the owner, opened the doors of a business he felt provided “a service that was applicable to, and gave back to, the local community.” He asked himself what the local community needed and wanted. He recounted a story for us which he said embodied what it meant to be part of the community. The thing that happened in our 1st months that was so sweet…one Saturday night the only fridge in the shop went out. Word spread that the store was going to have to close until the problem could be fixed. All the customers brought the milk home and kept it in their fridges. They even brought it back the next day! That brought home the power of ownership for me. Many of Robert’s business practices were inspired by customers and by his own experiences as a customer. Instead of opening the doors exactly at 6am, Robert lets in the few folks who arrive early. They can sit inside the warm coffee shop (especially when it is cold or raining, etc) instead of being left in the cold. He said taking ideas from the customers empowers them and helps them have a sense of ownership in their local coffee shop. Robert has created a space where the community can come together to support one another after the storm. He also explained that time in New Orleans is separated into two periods: “before the storm” and “after the storm”. 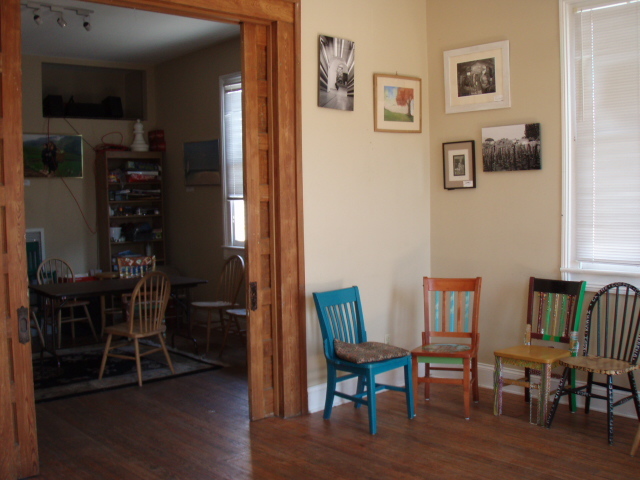 Above the busy and bustling space where coffee is prepared and served is a space used for community organized events. 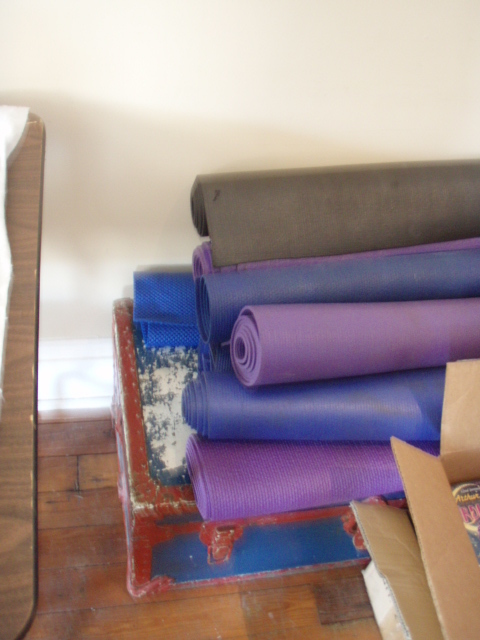 Two large rooms and a bathroom are filled with bookshelves, yoga mats, chairs designed by local artists and tables. The front room has two large windows that let in beautiful afternoon light. While we were chatting with Robert a woman approached him about using the space for an art class. Robert explained that he charges no rent for the space. He only asks that his staff are able to attend the meetings and classes if they are interested. Robert also facilitates connection between community members. He introduced us to a local activist and told us about the food map that developed post-Katrina to ensure access to safe, nutritious, and enjoyable food: NOFFN.ORG. During our meeting a friend of Robert’s pointed out a woman from a local apartment building who was struggling to remain in her home. Robert immediately called a lawyer who lived in the local area and a few minutes later they were sitting together just a few tables away. Fair Grinds employs a number of environmentally friendly practices: the to-go cups for cold drinks are made from biodegradable corn starch and the baked items come from numerous local bakers, and coffee grounds are given to community gardens right near the store. When municipal recycling disappeared post-storm, Robert found a place that would recycle cardboard and newspapers. The icing on the cake of Fair Grounds was chocolate. All the chocolate sold in the store comes from Ghana, through two different companies. Fair Grinds gets their chocolate syrups and powders from The Omanhene Cocoa Bean Company, which creates the finished chocolate product in-country (which is rare). We encourage you to read about the amazing work of this company by clicking on the link above; we were really impressed. Also, the chocolate bars sold in store come from Divine Chocolate: A Farmer-Owned Fair Trade Company. Our morning at Fair Grinds was a stupendous introduction to New Orleans. We spent the afternoon with our friend Farhad talking about the struggles and successes of community building and local education post-Katrina. We wake up in Raleigh at an uncomfortably early hour to pack the car and head out for Atlanta, Georgia. Late that afternoon we arrive in time to meet with Chris Owens at the Counter Culture training center in Atlanta. The space is beautiful – a coffee fans fully loaded, well lit, wood floored, clean, workspace (not that wood floors have anything to do with good coffee, but we appreciate them). Chris told us about Counter Cultures free training programs and we talked at length about purchasing contracts, relationship trade and direct trade. There is a growing movement towards these forms of trade. Relationship Trade, Fair Trade and Direct Trade are all structures that work to create a more equitable exchange of money for goods. What this means is that more money is making it back to the people who are laboring to produce the coffee beans. The general idea is to build close professional relationships with people in as many stages of the trading process as possible; farmers, coffee farming cooperatives, importers, roasters and consumers. We, CoffeeInAction, believe the ideal situation would be to know the owner of the farm and be able to purchase and import green beans (un-roasted coffee) directly from the farm. While this is the ideal, for many reasons this is not always possible. One example of a relationship or direct model is when the roaster and farmer agree on a price for an amount of coffee. The roaster then calls an importer (who s/he would have a relationship with) and asks for that shipment to be placed. The importer is paid enough money by the roaster to cover processing fees plus a profit margin, and the beans are shipped. A small number of businesses have been able to adopt this model of trade. Throughout our trip we have seen that this concept is expanding within the field. Almost all coffee that enters the US does so through a coffee importer/distributor. Over time a coffee distributor will learn that certain roasters are looking for certain kinds of coffee. The importer will learn more about that kind of coffee, what farms are working that way, and develop relationships with coffee farming cooperatives or individual farms that meet these requests. Sometimes after a relationship is formed this way, the loop is completed when the roaster is able to travel to origin and meet the farmers whose beans they have been roasting. At this point many people have heard of Fair Trade: be it coffee, tea, chocolate, honey, rice, the list goes on. Fair Trade is a label given to things that have been certified by Transfair USA. On the transfair website the mission states “TransFair USA enables sustainable development and community empowerment by cultivating a more equitable global trade model that benefits farmers, workers, consumers, industry and the earth. We achieve our mission by certifying and promoting Fair Trade products.” The Specialty Coffee Association of America (SCAA) states “Fair Trade Certification has proven to be a valuable tool in providing integrity and transparency to coffee commerce and in building consumer demand for Fair Trade coffee. SCAA also recognizes that there are other ways for members to promote the concepts of equitable trade, sustainability and transparency.” As we learn more about equitable trade, we are learning how specialty coffee business around the U.S. are incorporating one or more of these concepts into their own company. 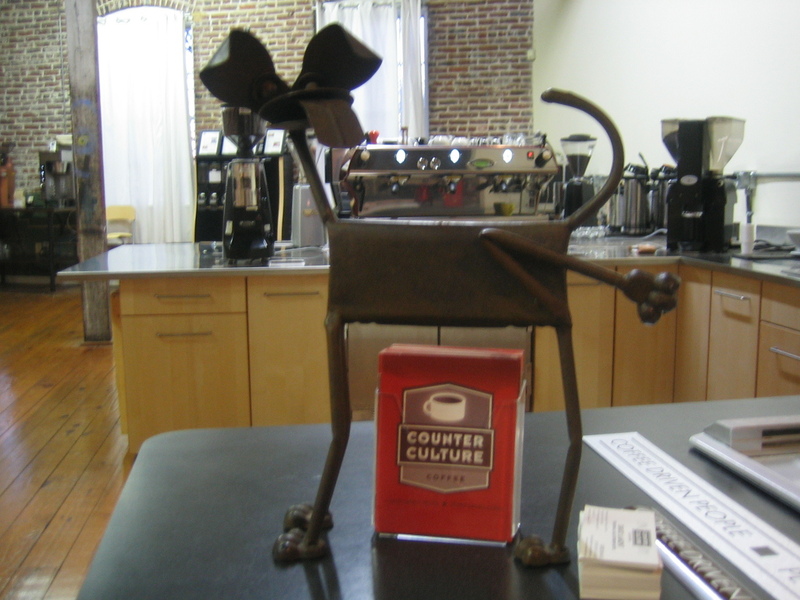 Counter Culture has a direct relationship with many coffee farms. An essential difference between relationship trade and conventional trade is the nature of the contracts. Chris explained to us that Counter Culture relationships intend to create contracts with individual farms or cooperatives to ensure that labor costs are covered, as well as the price of coffee for that season.